The French recipes in these meal-kit subscription services in France will get you cooking French food in no time. Meal kits are all the rage in the US and gaining popularity worldwide. They’re even gaining popularity in France, the culinary gourmet capital of the world. 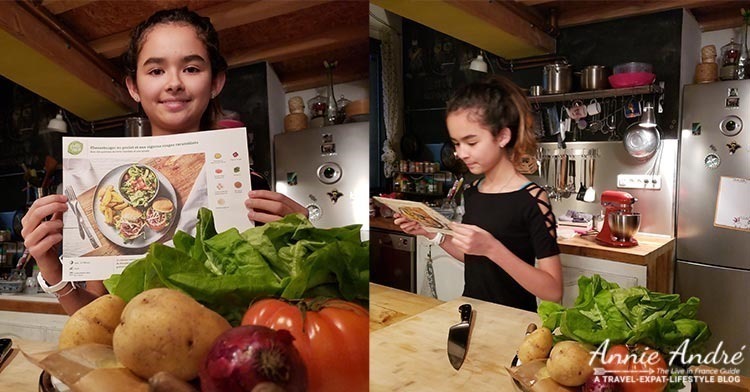 It’s no wonder Meal kit recipe boxes in France look a little different than the rest of the world! Meal kit delivery services are a relatively new concept dating back a little over 10 years to 2007 when Middagsfrid.se, a Swedish brand and meal-kit company created the business model for the first internet-based meal-kit delivery service. (The Swedes also gave us Ikea). 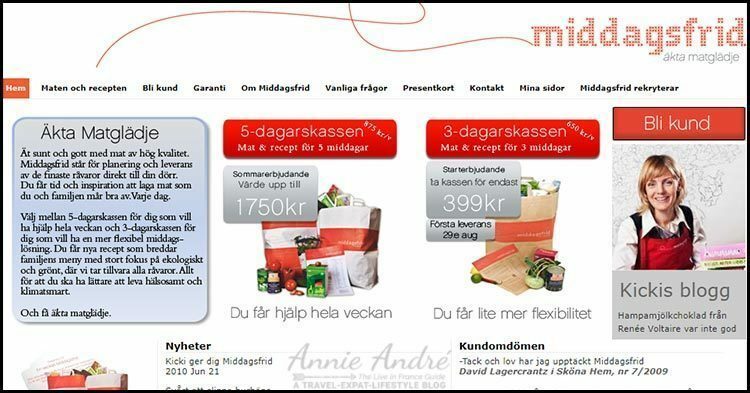 Check out Middagsfrid’s website back in late 2009. Their website looks much more modern these days. Meal kit delivery services are a convenience subscription service which combines the efforts of chefs, nutritionists and personal shoppers to deliver pre-measured ingredients from a list of weekly recipes right to your front door so you can make delicious home-made meals quickly without the hassle of looking up recipes or shopping for the ingredients. Hello Fresh (France) discount 25 Euros. How do meal kit delivery services work? In general, each meal kit company works the same with slight variations. Each weak you pick three to six new recipes for two to six people or let the website automatically choose recipes for you. You then choose the delivery time and wait for the ingredients for the recipes to arrive at your front door. Inside each box are recipe cards with detailed instructions and photos showing you step by step how to recreate the meal. So easy my daughter follows them perfectly. 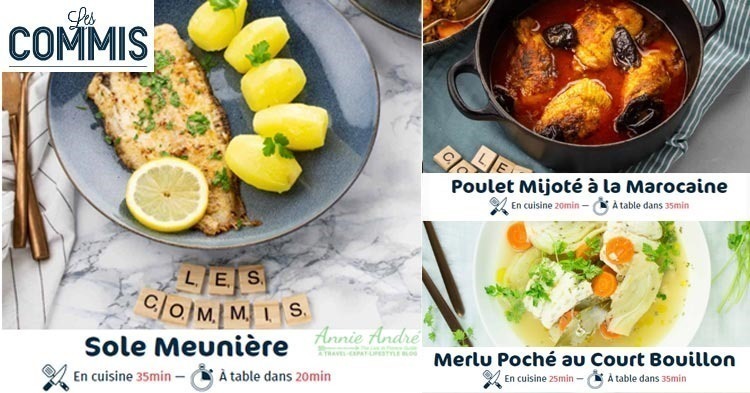 In France, a meal kit, meal box, recipe box or whatever you want to call it in English has just as many names in French. I’ve seen the term “box repas” and “kits-recettes” thrown around but the most common term used in French is probably “Pannier repas” meal basket. What’ so different about a French “pannier repas”? Meal kits have to appeal to the local people so the recipe’s you see in French meal kits are going to appeal to French people. You won’t see recipes for Maple glazed pork chop, Southern Fried chicken or Monterey jack burgers. And you certainly won’t see Burritos or Enchiladas. These dishes just aren’t popular in France. You will see lots of French recipes as well as international dishes that are popular in France. International cuisine popular in France include Italian pasta dishes, Thai, Chinese, Indian and sometimes Japanese or Korean recipes. Moroccan food is also very popular in France but Mexican food is not. 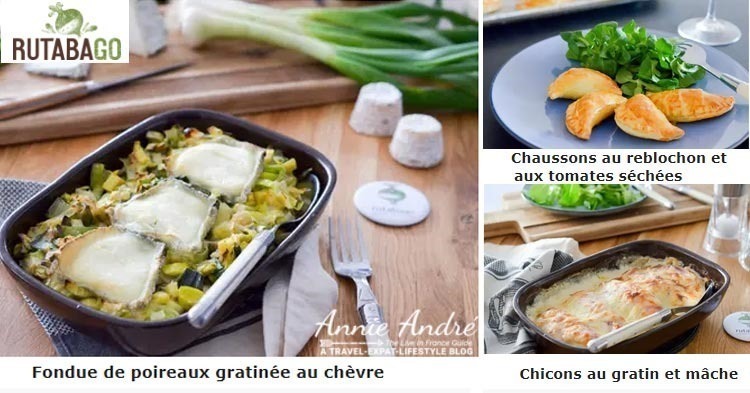 When cheese is part of the meal kit recipe it will probably be not the kinds of cheeses you’re used to unless you eat a lot of French cheeses like Comté, blue cheese, brie, Reblochon, maybe feta etc. I have yet to see cheddar in a meal kit recipe and you’ll never find Monterey jack either. 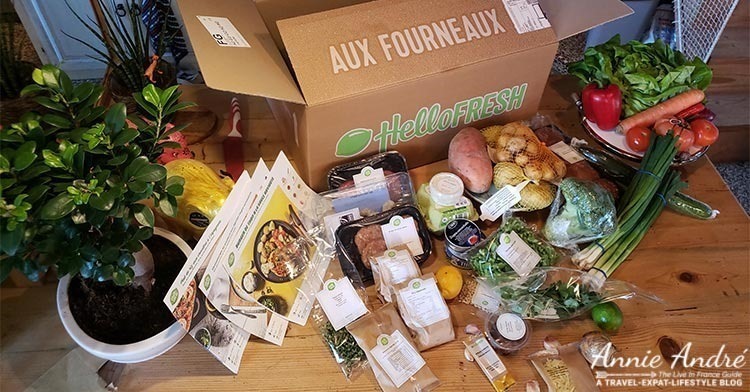 HelloFresh does an excellent job of localizing their meal kit recipes for the French market. 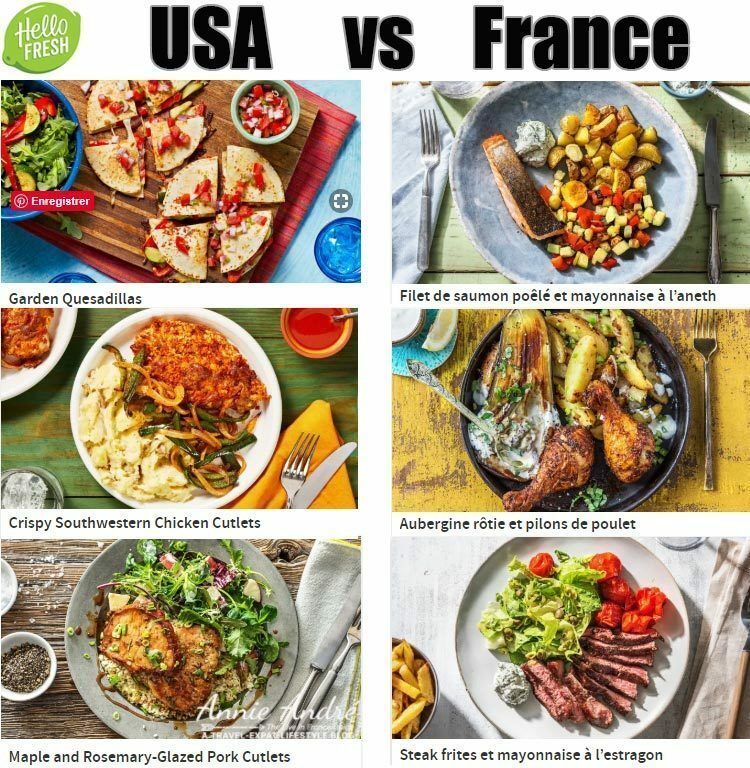 Here’s a side by side comparison of the recipes offered on HelloFresh US site vs the HelloFresh France site for the same week. 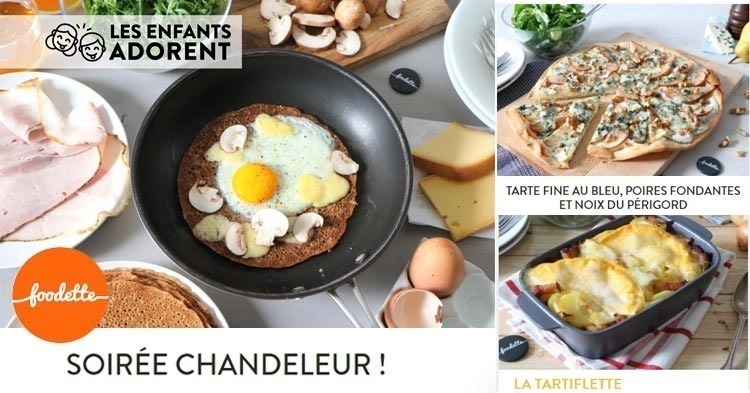 Below are 10 meal kit companies operating in France. Although all of them offer some international options, I’ve opted to show you just the French recipes they offer. 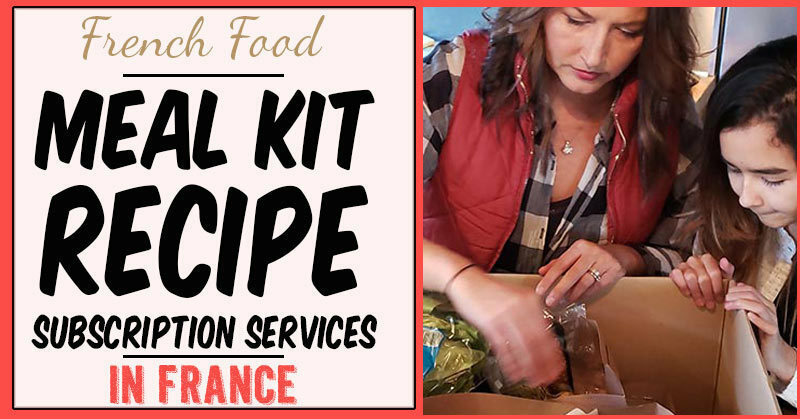 I’ve signed up for several of the meal kit subscription services below and I use them to learn and try new French foods that I can cook at home. First on the list is HelloFresh. HelloFresh is the largest meal kit delivery service in the U.S. and the only meal kit service that I know of that has operations in multiple countries. 11 so far across three continents including the UK, Canada, Switzerland, Australia, Austria, Germany, Belgium, New Zealand, Luxembourg, the Netherlands and of course France. I did an unboxing video of their meal kit recipe which you can watch at the top of this page. Duck confit with raisin, glazed carrots and mashed potatoes. 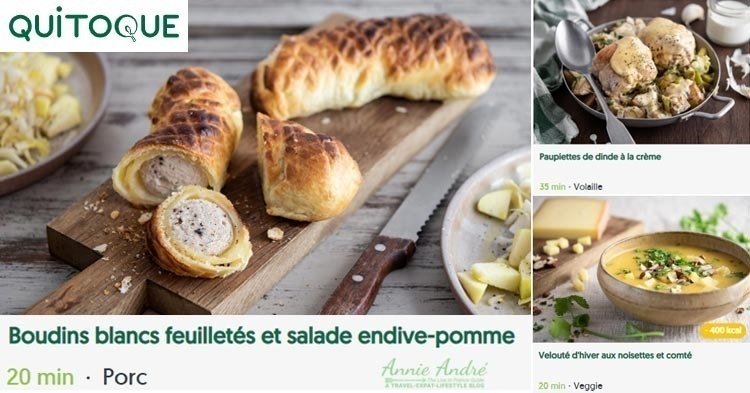 A lot has changed since this French meal kit company began in 2012. Originally called “Cookin the world”, their focus was on food from around the world. 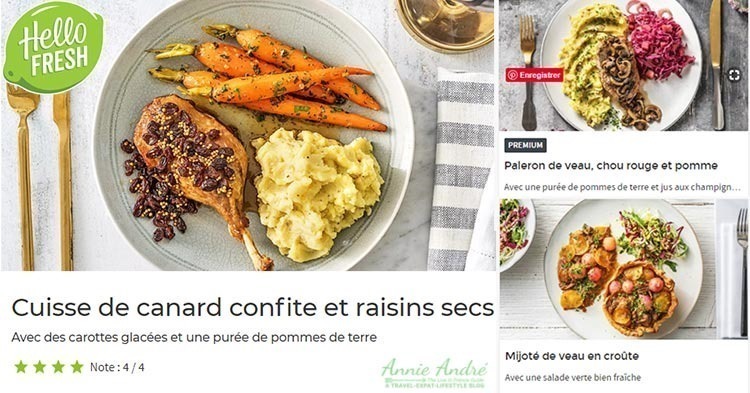 In 2014, they changed their name to “Qui Toque” and focused on “les panniers recettes à domicile” meal kits for home delivery. Their recipes now feature French recipes with a healthy dose of International, especially Asian recipes. More recently in 2018, Carrefour ( a huge grocery store chain where I shop for my groceries) bought a significant stake in this company probably to capitalize on their internet presence among other things. White (pork) sausage in a puff pastry with an apple endive salad. Founded in 2015 by Olivier Tangopoulos, you could classify Foodette as somewhat of an ethical meal-kit subscription service. They claim 80% of their fruits and vegetables are organic. All the eggs in their meal kits are also organic from free range chickens, and their meat is of French origin and contain the Red Label (an official sign that guarantees you’re buying superior quality or made with more rigorous standards than food that does not have the label). They also have kid-friendly recipes for French kids. Crepes made with organic black wheat flour (blé noir), topped with artisanal ham (nitrate free), organic egg, mushrooms and raclette cheese. AOP Roquefort cheese tart with Greek yogurt, pears and organic nuts. Tartiflette- a very popular winter dish in France which consists Reblochon cheese and lardons (similar to fresh bacon bits) all topped with an organic mash potato served with a mâche salad. Les Commis, pronounced (lay Ko-me) translates to “the junior chefs”. 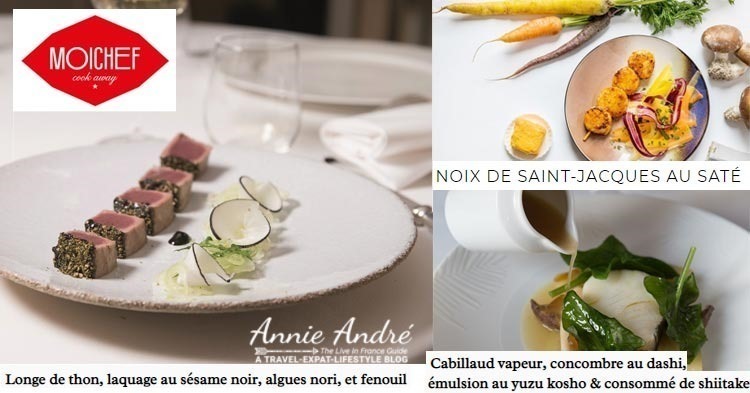 Launched in 2012 by Cyril Francin, Les Commis originally offered gourmet meals for special occasions like New Years, Christmas and St. Valentines. 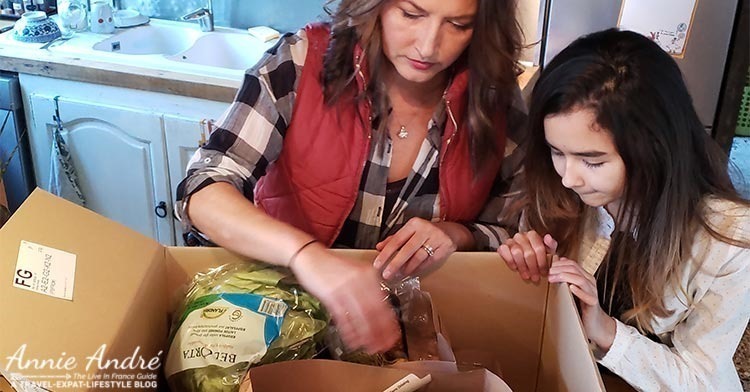 In 2016 they expanded their offerings and joined the meal kit market and now offer six new recipes each week which you can cook at home in 30 minutes or less. Recipes are created by chef Owen Marlaud who finds his inspiration in French gastronomic tradition, his many experiences in the four corners of the world and fresh seasonal products. Sole Meunière served with lemon parsley butter and potatoes. Moroccan stewed chicken: Moroccan dishes are quite popular in France. 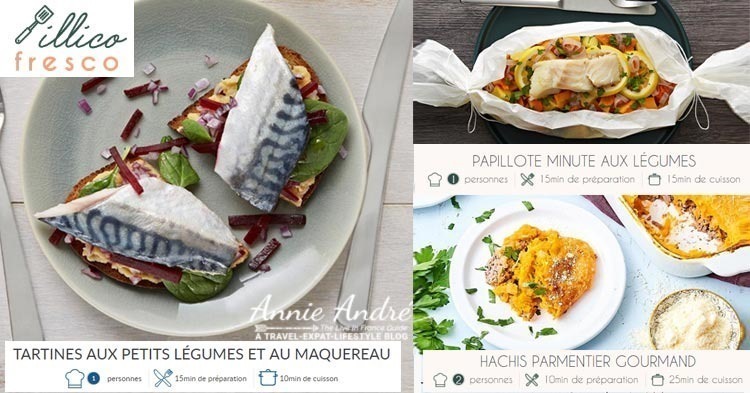 Cook Angels is a meal kit delivery service founded in 2012 by two Parisian women. They have a smaller offering than some of the other meal kit subscription websites, 5 recipes per week to choose from. Type of Cuisine: Mainly French with an occasional international dish. Another ethical meal kit company. Rutabago was founded in 2015 by Pierre Pathy and serves up recipes that focus the quality of the ingredients which are 100 percent organic and eco-responsible and sourced locally as much as possible. Each week four chefs consult with dietician-nutritionists to come up with five new recipes. You can also add breakfast, fresh fruits or bread to your order for an additional fee. Simple et Bon was the only meal kit company on this list that had no international dishes. That could change in the future, but for the moment it’s French recipes only. Simple et Bon operates slightly different than any other box recipe service. 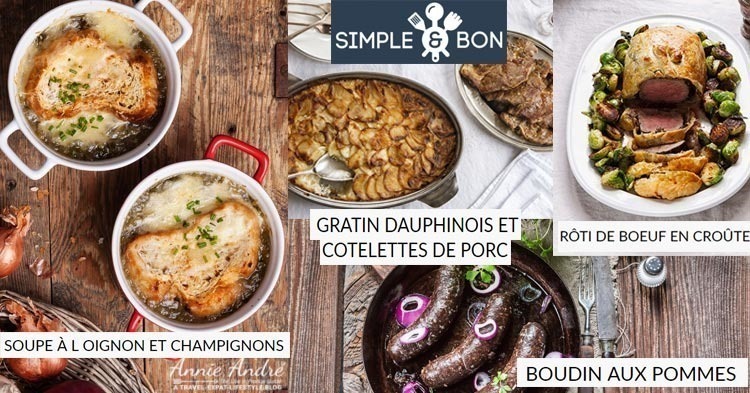 Where other meal kit companies only allow you to pick from that week’s menu of recipes, Simple et Bon enables you to select any of the recipes from their archive of 250 recipes. Like a recipe? You can have it sent to you week after week. Another interesting feature is you can remove or add items from the list of ingredients. Already have too many onions? Just remove them from the list. Want carrots just because? Add them to your basket. You can also add little extras like deserts and cookies etc. Overall, I like Simple et Bon a lot. It’s a great way to discover French recipes you would never have thought to try and their meals are a little fancier. Roasted beef en croûte (wrapped in a pastry). Very similar to beef wellington. Twenty euros discount off your first order. Click the link above. Type of Cuisine: Mainly French cuisine. Illico Fresco is the new kid on the block of meal kits. They offer vegetarian dishes and even weight watcher recipes. I debated whether or not to put Moi Chef on this list because they don’t offer daily or weekly recipe boxes. Instead, they offer one recipe box per trimester created by Michelin star chefs and the best chefs in the world. The idea behind this gourmet meal kit subscription is to teach you the techniques of the grand chefs so you can recreate them at home, preferably with someone. Yes, 79,90 € / box / trimester. But it’s a unique idea and makes a great gift. 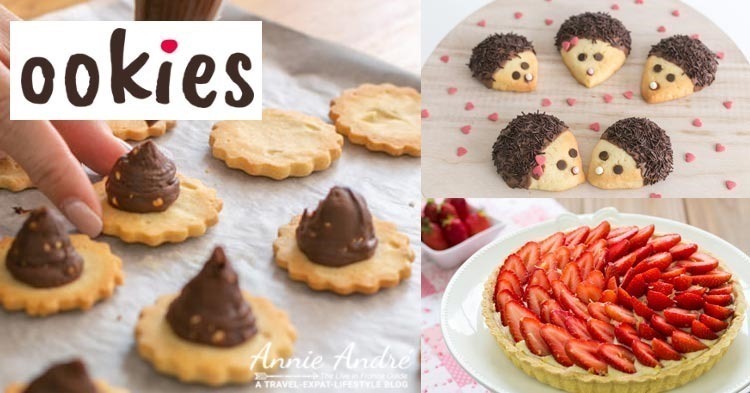 Ookies is a monthly pastry-kit recipe box aimed at parents who want to explore pastry and dessert recipes with their kids. Each month you get a new box containing a dessert recipe of the month. I wasn’t entirely on board with the idea of meal kits in the beginning, but I fell in love with the service after the first box I received. Not only is it a great way to discover new recipes, but it’s also convenient for my busy life. Plus, it takes out the stress of coming up with new ideas and shopping for the ingredients every week.